Can you hear the difference between a £22k console and a £100 audio interface? 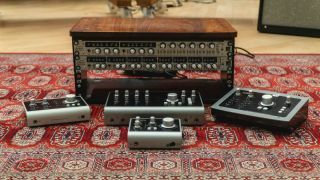 Audient claims to be the only company in the world to use the same console mic pre design throughout its product range. To showcase the level of quality they guarantee, whether using its large format ASP8024-HE console or its smallest audio interface iD4, Audient decided to put together a little experiment. Recruiting the guitar and vocal talent of singer songwriter Zach Johnson, Audient headed down to the amazing Visconti Studio at Kingston University and set out to record the same song using every one of its products. Here we’ll show you how the experiment took shape and how to obtain the sound examples of the finished article for you to make your own decision. Can you hear a difference? Each microphone was chosen for a specific reason. The SM57 is a very common mic that most people will know the sound of, the AKG C414 because it is a commonly used microphone to record both a vocal and guitar source, and finally the MKH40 for its very flat frequency response. The MKH40 in theory allows the character of the Audient mic pre to be heard without extra colouration. For both guitar and vocals, the mics were placed as close together as possible, lining up the diaphragms as best as possible to ensure the same distance between the source and mic. The mics for guitar were aimed between 12-14th Fret, about eight inches from the guitar. For vocals, Zach was about six inches away from the mics with a pop shield in between to reduce plosives. Audient began recording with the ASP8024 Heritage Edition in the Visconti Studio control room, then for the other products it used a laptop running logic in the live room, working up from the smallest interface iD4, to their 8-channel preamps ASP880 and ASP800. Zach was monitoring himself through the iD interface’s low latency mixer application and was recording to a click, so on listening to these samples, you should be able to switch between them and it remains in time. While Audient uses the same preamps in across the range of products, the converters are different; meaning, in theory, there is a slight change in sonic characteristics between products through the converters. The iD14 and iD22 audio interfaces use Burr Brown conversion, while the smallest interface iD4 and flagship iD44 use AKM converters, however the specifications remain comparable, and the sonic differences subtle. Each clip was edited down to size in Logic Pro X, with a short fade in and out during the silence on either side of the recording, then normalised and bounced individually from Logic (at the sample rate and bit depth of the original recording: 96kHz, 24 bit), without any other processing to make sure you get the true Audient sound. To hear the results, Audient has made the samples available for anyone to download as a zip file (~250MB). Watch the behind the scenes video on how they created the samples.